Some call it the “monkey mind,” that endless stream of thought that runs unchecked throughout the limitless boundaries of intellect. James Joyce captured it in Ulysses, an epic novel that analysts call stream-of-consciousness. But the Russian mystic G. I. Gurdjieff would deny that we rarely if ever, achieve true consciousness. Have you ever thought about what remains if and when you stop the mind’s chatter? 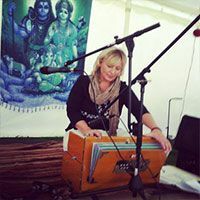 Kirtan is a form of yoga chanting, intended as a holistic healing experience designed to bring participants into a more organic form of meditation, either in stillness or in motion. One of the oldest of sacred sound traditions, kirtan’s call-and-response interaction involves Satsang, an ancient Sanskrit term that describes the community that exists between an assembly of people who listen to, talk about and assimilate their impressions of truthfulness. Kirtan allows the mind to remain awake and aware while simultaneously becoming quiet, still and centered. It is during the quiet moments between the songs that the place of awareness is often found - a feeling of interconnectedness and inner peace. Participants frequently use rhythmic drumming to accompany the kirtan leader’s mantras (chanting phrases) in cyclical manner, which may repeat at a faster pace. This method of meditation synchronizes breathing, movement, and voice. “The practice of kirtan does not require musical ability or training; it is about the heart. These ancient chants contain powerful healing and transformational energies that serve to reconnect us to the ever-present and eternal being that lies within,” explains Milwaukee’s award-winning kirtan leader, Ragani. “All of the mantras, melodies, and instruments are designed to lead us toward this meditative state. Although the language of kirtan is often in Sanskrit, the true language of kirtan is universal, because it is a language of the heart." Quieting chatter in the mind and becoming centered in the heart is one of the many benefits of a regular kirtan practice. Anyone can participate regardless of age or spiritual beliefs. It's about the experience of community that takes place while chanting, once you take a seat, sing and become quietly aware. You are invited to experience kirtan at Balance on Buffalo, 924 Buffalo Street, Manitowoc, WI on the 3rd Friday of each month from 7pm - 9pm. Donation Based. Balance on Buffalo offers massage therapy, yoga, wellness classes and workshops. The goal of Balance on Buffalo is to create a safe container for those searching to empower themselves by uncovering their own unique gifts .